This is a book that has been recommended to me for years, and although I’ve read a handful of books on Buddhism (Zen Mind, Beginner’s Mind is my all time favorite), I always overlooked this one. 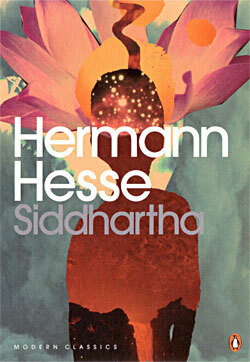 Siddhartha is a story about the life of Siddhartha Guatama, a seeker of spirituality in ancient India. When Siddhartha is a teenager he leaves his home and sacrifices everything to become a wandering monk and embark on a search for wisdom. His journey takes him across India as he discovers spiritual gurus, falls in love, and pursues enlightenment. Along his path Siddhartha wrestles with problems common to us all and draws upon lessons learned from the universe — from birds, trees, and a mystical river. Siddhartha, like Buddhism, eschews much of the baggage of the traditional concept of religion and discovers the miracle in all things. In this way, it’s not unlike transcendentalism, championed by Emerson and Thoreau. Siddhartha is a much more enjoyable reading experience though, perhaps because it was written in the 20th century and flows in a more modern and familiar way. It’s easy to pick up and read. Although I waited a long time, reading this book now has given me great satisfaction because it’s certainly among the best that I’ve read in recent years. The vivid descriptions of intricate physical environments and heady spiritual states in Siddhartha are captivating. Seek this book out.